Ducati India announced the opening of bookings for two new models with the entry of the Ducati Monster 797 and the Ducati Multistrada 950. 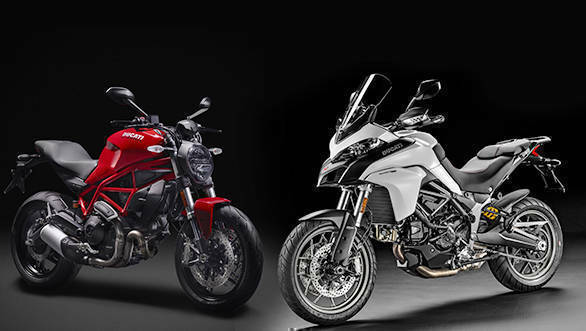 Both models are positioned as the entry-level models to the Ducati's Monster sport-naked and Ducati's Multistrada adventure tourer ranges respectively. 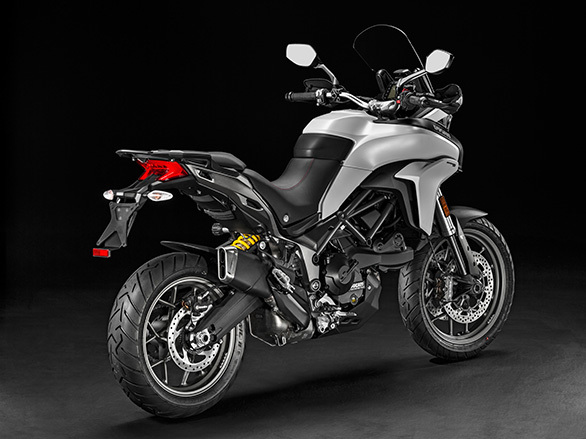 The 75PS Ducati Monster 797 completes the missing piece of the affordable Ducati puzzle while the Multistrada 950 is set to play in the same segment where the Triumph Tiger does so well. Let's start with a quick look at the bikes. The idea of the Rs 7.77 lakh (ex-Delhi) Ducati Monster 797 isn't new. The 796 and then the South Asia specific 795 were the earlier avatars of the affordable, entry-level Monster. And now that Ducati has the top 1200 and the middle 821 in place, it is time to shore up the affordable end of the line. The 797 uses the same 803cc 90° V-twin (or L-twin as it is sometimes called) as the Scrambler in every aspect of the specification, including the gearbox and gear ratios. This brings 75PS of peak power at 8,750rpm and 69.4Nm at 5,250rpm to the package. The final drive gearing is also shared with the Scrambler Icon. But that is where the similarity ends. The Ducati 797 chassis is all new, returning to a single-unit trellis frame from headstock to pillion grab rails like the first Monster had. 43mm forks are on duty up front with a direct-mount rear monoshock. The brakes are top-flight specification for the class with twin 320mm front discs and Brembo's M4.32 radially mounted monobloc callipers. As Ducati's tend to these days, there's a LCD screen that shows a remarkable amount of information - the 797 loses the gear indicator though. The bike also has traction control and ABS as standard. 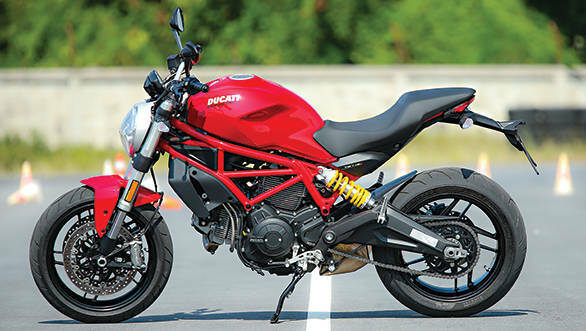 We have tasted the Ducati Monster 797 and our first impressions were very good. The ride-by-wire system works hard at making this a smooth motorcycle while the slip-assist clutch makes for light clutch effort. Seat height is reasonably low and the package is designed to be friendly and easy. And of course, all that is wrapped up in Ducati's signature lines. This time the tank with the incredible shape is steel, shared with the Monster 1200. A round headlamp is employed although looking closely at it reveals that it is far from a simple round head lamp. 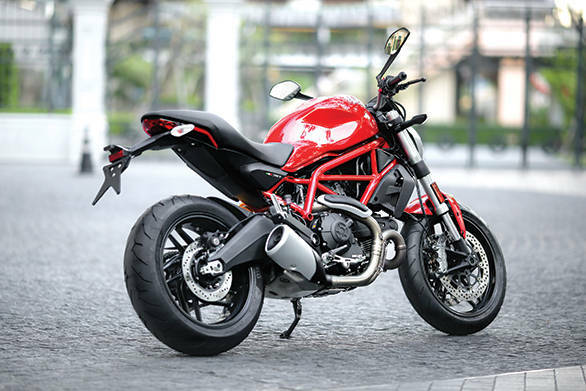 The playing field for the Ducati Monster 797 includes some very nice motorcycles though. That includes Ducati's own Scrambler line (Icon, Rs 7 lakh) as well as the sharp new Kawasaki Ninja 650 and Z650 (Rs 5.15 lakh), Triumph's Street Twin (Rs 7 lakh, all prices ex-Delhi) and siblings and at least a two or three Harleys including the new Street Rod. But the beauty of the Indian market is that it is still growing, and new models are more likely to expand the market than cannibalise sales and cause manufacturer depression. Watch out for a road test on OVERDRIVE soon! The Rs 12.6 lakh (ex-Delhi) Multistrada 950 is a delicious blend of the Multistrada 1200 and the Enduro with an engine from the Hypermotard. It sounds like a parts bin special but it is far, far from it. 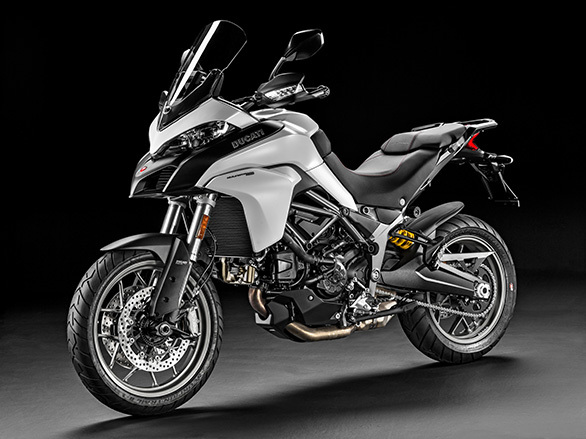 The body panels are more or less exactly the same as the Multistrada 1200, but some of the chassis dimensions and equipment are more reminiscent of the Enduro. But let's start with the engine. The Multistrada 950 engine is the 113PS 90° V-twin displacing 937cc, exactly like the one in the Hypermotard down to the gearbox. It gets a slip-assist clutch, does not get Ducati's variable valve timing and is, naturally, fuel-injected, liquid-cooled and has ride-by-wire. Now the frame and the steering geometry is just a smidge sharper than the Enduro but not as quick as the 1200. It shares its wheelbase with the Multistrada and gets the brakes and tyres at the same spec as the Enduro although it uses 19- and 17-inch alloy wheels. What that means is that the chassis spec is of a very high order despite the 950 being positioned as the entry-level adventure tourer. Similarly, the shocks might not be electronically controlled like the S/Enduro or have 200mm of travel like the Enduro but they do offer 170mm of travel, and the KYB front and the Sachs rear are both fully adjustable. In terms of equipment, the Ducati comes loaded. ABS, riding modes, traction control, all of that is standard. There is also a LCD screen that shows you what's going on. The Ducati Multistrada 950 enters a delicious segment which sees worldwide popularity. In India, the Kawasaki Versys 650 (Rs 6.6 lakh ex-Delhi) is the entry point but the Triumph Tiger 800 (Rs 11.83 ex-Delhi for the XRx) - due for a refresh next year, we believe - dominates the space. The Ducati pricing puts the Multistrada 950 bang in the middle of the space, and this should be a fun battle. Ducati India is officially opening bookings today with deliveries expect to start within the week for the Monster 797. The price of the Monster though will be revised upwards post GST. On the other hand, the Multistrada 950 price is post-GST and deliveries will begin in July. These prices are good for the model specification, and Ducati's ability to offer great pricing as well as premium equipment is still a little hard to fathom. On the other hand, Ducati India is working towards further shoring up its service experience and it will also open new dealerships in Kolkata and Chennai this year. Ducati aims to have a dealer in Hyderabad by first-half of 2018 as well. Watch out for stories on both the bikes on OVERDRIVE soon.